(Newser) – Skeptics took a we'll-believe-it-when-we-see-it approach to the news that Boko Haram had struck a deal to release the 200 or so abducted girls in its custody. A week later, those skeptics are looking like the smart ones. Not only have no girls been set free, but Reuters reports that the group abducted 25 more girls from a remote section of northeast Nigeria. Residents of Adamawa state say insurgents attacked two villages on Saturday, the day after a ceasefire had been announced by the government, reports the Telegraph. Here's an idea: Fool them into taking 25-50 new Ebola laced patient's; problem solved in 6-weeks ! ! ! 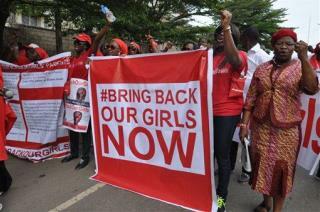 There's no sign that original abducted girls will go free? They're hold one up right there in the photo! Sooner or later, someone over there is going to get really damned pissed off at Boko Haram and walk into their camp unarmed -- but with Ebola -- and wipe out the group.